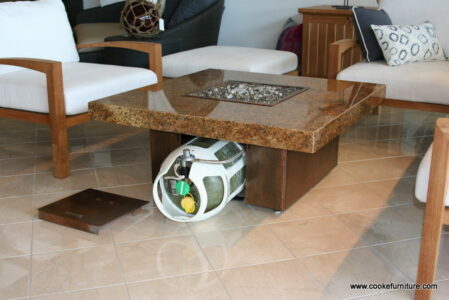 COOKE Furniture has an enviable reputation for creating the finest quality fire pit tables and outdoor furniture. We specialize in manufacturing custom fire pit tables using the highest quality stainless steel, acid washed copper, and striking stone surfaces including granite and marble. Our product line is constantly growing and evolving as we design and engineer new custom products. Our stainless steel outdoor furniture products and fire pits are guaranteed for lifelong structural integrity in any climate. Each piece is engineered to last and is manufactured in California. Apart from adjusting sizes and heights of our featured COOKE designs, we also collaborate with design professionals to create statement pieces that are one of a kind. We welcome unique ideas from our clients and can create tangible furniture designs from simple sketches or specs provided to us. The majority of our fire pit tables are outfitted with stone table tops which are fabricated from stone slabs in the same manner as kitchen counter tops, allowing you to choose the thickness and edge detail for your table. You may also hand pick a stone slab from any stone supply yard such as Arizona Tile, and we will arrange for that slab to be processed for your table. Other potential table top materials include hammered copper, teak, various metals and man-made surfaces. Our stainless steel table bases and other components may be copper plated or powder coated. Powder coating adds to the durability of our tables and offers 6500 colors to match any decor. Additionally, laser engraving, ceramic coating and various other processes can be performed to deliver the custom touch you are looking for. Please feel free to contact us to discover your possibilities. With the ability to incorporate forced air heaters into many of our fire pit tables, COOKE Furniture offers a unique outdoor heating solution that is stealthy yet effective. Warm air is delivered through fully adjustable vents located just below the table top and may also be used to warm the stone table top. Ready to order your custom fire pit table? Contact us today! 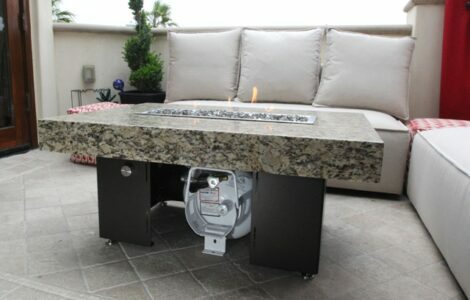 Most Cooke fire pits feature the ability to hide a propane tank to fuel the fire. The fire pit tables that are 21 inches tall and taller can hide a 5 gallon or 20 pound vertical propane tank also know as a “regular BBQ” tank which is widely available and used in barbecues and patio heaters. The fire pits that are lower than 21 inches such as the Montecito, Famosa and Santa Barbara hid a horizontal propane tank. These horizontal tanks can be filled and any gas station that fills BBQ tanks or any propane supplier. 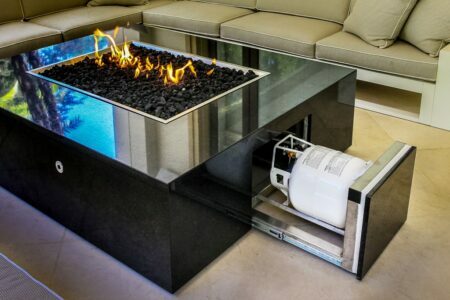 When you are searching for a lounge height fire pit table that offers a hidden propane tank Cooke Furniture has the solution.